Morgan/Percival Loop Redux – Do You Burn More Calories When It’s Cold? Last week at work was one of those weeks I’d like to forget. I’m in IT, and we’re doing a myriad of system changes to get ready for our peak season freeze. We process payment cards, and our peak season runs from the US Thanksgiving holiday through the first week of 2010. In other words, we’re right up against it – not that many more weeks to get changes done. So I spent my week troubleshooting weird issues, on the phone in conference calls, getting up in the middle of the night to come in for a change window, etc. I was desperate for a hike on Saturday, almost panicky: “If I don’t get out of here, my head’s going to explode.” So we got out. 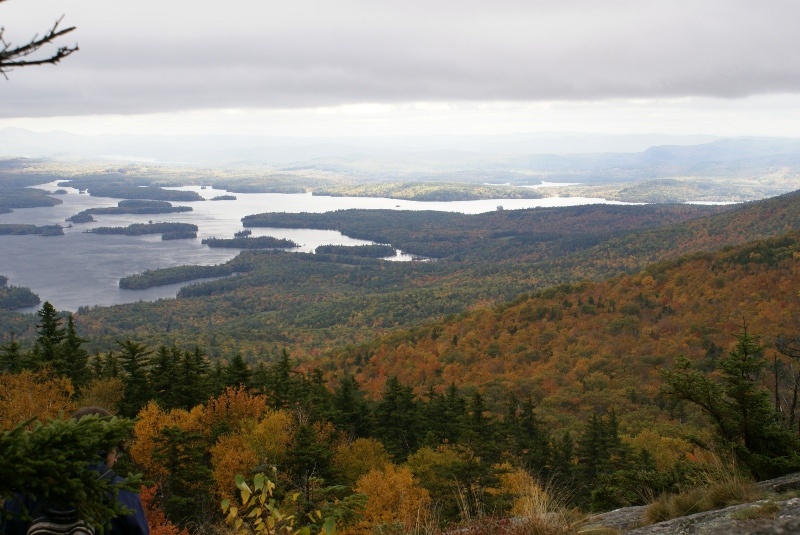 I packed up with the wife and my kidlets and headed for the familiar Morgan/Percival loop, overlooking Squam Lake here in New Hampshire. The weather was pretty yucky, having rained the previous day. We were on the edge of a changing front, meaning the occasional remaining sprinkle and a good bit of wind, not to mention cloud cover. Oh – and cold: around 50ᵒF at the base, and in the 40’s along the ridgeline with greater exposure to the wind. I don’t love the cold, but I don’t mind it when I’m properly clothed. I just didn’t have a jacket to act as a windbreaker. I had to keep moving to stay warm enough. The conditions weren’t life threatening, nothing like that. New Hampshire in the fall is hardly the arctic tundra. But cold, windy, moist conditions can sap your energy and motivation, and make for a grumpy hike. Everyone did okay, though – we didn’t lollygag at the summits very much, especially not on the top of Mt. Percival where there wasn’t much of a place to get out of the wind. You kind of have to hunker down on the granite slope below Percival summit level while the wind blows over the top of you (mostly) – cold comfort indeed. Gloves would have been nice. Does one burn more calories when exercising in cold weather? Not sure – something to Google later. I will say that I felt really good on this hike. This is about a 5 mile loop with steep elevation change in the upper third of the slope. The top of Percival is a rocky scramble requiring careful foot placement and the odd handhold to pull yourself up and over outcroppings. I had lungs, heart, and muscle to spare today. I think the stairclimber at the gym is helping out. 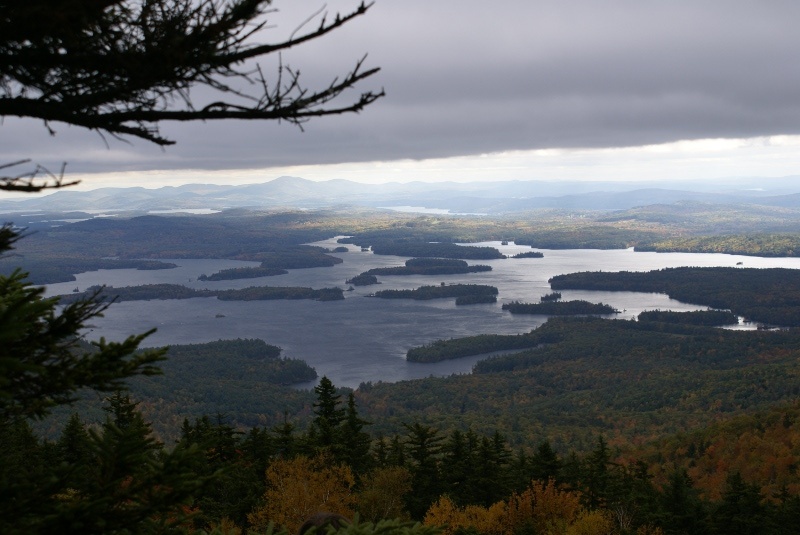 A couple of shots from the Morgan summit; we were hunkered down near some pines and behind some rocks, still overlooking Squam Lake, but out of the wind as much as possible while we ate our lunches. You can see the sun breaking through at various points. In the last half of the descent from Morgan, we saw quite a bit more sunshine.